Treats You Can Give To Your Chickens!!! Like children and adults, chickens also need treats that will motivate them to live healthy and happy. But! Unlike children and adults, the treats for chickens are different and are more nutritious. Any fruit is the best treat for your chicken. Compared to human treats that mostly comprises of chocolates, candies, and other sweets, chicken treats are more on veggies and fruits. 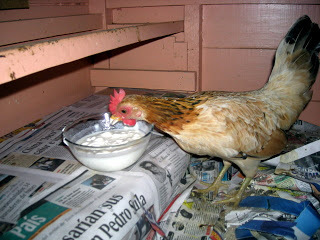 Yogurt is a classic favorite of them birds. They are tasty and are very good to the intestines. This is also a good source of calcium that can contribute greatly to the structure and health of the eggshell. But the most favorite and is very popular among every living chicken is the worm! They will eat it so fast and not a single evidence of it will linger. Chickens, even with puny brains, have in it the command to like or dislike a certain treat. Below are some of the things that in general, chickens will come running for. If the first one didn’t work, scratch it off then proceed to the next. Bon appetite! May come in raw type or in applesauce. The seeds contain a small amount of cyanide but it’s so small that it can’t affect the chicken’s health. One of the good treats. This is also high in potassium thus; it is good for muscle activities. You can choose to hunt it or otherwise buy it in a pet or bait store. This is also a nice treat to give them. You can watch them run around chasing the critters plus it is a good source of protein. Give the mature ones because they love it when the seeds and flesh is soft enough to peck on. Fruits. There are exceptions. But the best fruit treats are peaches, pears, cherries, etc. Some say that it is not wise to give fruits to egg laying hens but some would beg to differ. Leftovers. When we say “leftovers”, it must be something that came from a human’s plate minutes after mealtime is over. It must be edible. Anything that came out of your fridge that is considered as moldy or spoiled is not advisable. Don’t give anything salty. Handing chickens is an art, and practice makes perfect! The secret is a combination of being gentle and firm by letting them be aware that no matter how much they wriggle or squirm, they would not be able to get away. Always guide the chicken towards the exit of the cage by placing your dominant hand over its back to make it face the opening of the cage. When you are ready to take the chicken out of the cage, place your other hand under its body with your forefinger between the legs, and grasp one leg with your thumb. Maintain your dominant hand on the chicken to restrain it and slowly bring it out of the cage. In this position, the bird can be examined for culling, checked for external parasites, or evaluated for the other purposes. With the same hold, the bird can be comfortably carried resting on the arm against the holder’s body or restrained by holding the bird against the body with the arm. To get the best effect from keeping chickens, I highly recommend that you try building your chicken coop from this manual. I used it for my coop and I am more than satisfied from the outcome. Previous Article 8 Most Dangerous Chicken Predators. Be Aware of Number 2!! Next Article How To Care For Your Baby Chicks!! !